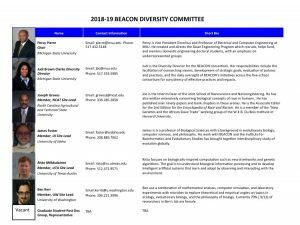 BEACON has effectively institutionalized its two overarching diversity goals by: 1) ensuring diversity is represented as an inclusive and connecting thread through all aspects of BEACON, and 2) exceeding national norms for diversity at all levels in the Center. 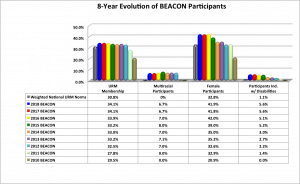 This accomplishment demonstrates a collective core value of diversity within our research opportunities, grant submissions, broader impacts efforts, educational outreach activities, formal mentoring training/support, fellowships, and direct student support funds. We are pleased to report that BEACON is achieving diversity through its inclusive efforts of continuous conversations, inclusive recruiting, supportive environments, and the leveraging of strong partnerships and programming to ensure consistency and sustainability.